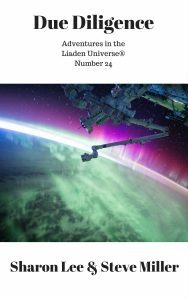 Due Diligence: Adventures in the Liaden Universe® Number 24 has been published to the Usual Suspects (including but not limited to: Baen ebooks, Kobo, BN, Apple, Amazon) and will be available for sale as the Various Ghods of Indie Publishing will. Novella “Due Diligence” is Lee & Miller’s 81st fiction collaboration. When Clan Korval knows your name. . . Abandoned on a strange port by a scam gone bad, his license to pilot rescinded, and his pockets very much to let, Fer Gun pen’Uldra was teetering between trouble, more trouble, and bad trouble. Cornered in a cheap bar by a too-knowledgeable stranger with an unlikely offer, Fer Gun realized having no money and no license might be the least of his troubles. Clan Korval knew his name and that proposal was hard to refuse. . .
2 comments to Watch the Skies! Great background on Chi, Daav, Daav’s father and Kareen. I also liked the part about how a contract should serve all parties involved. Thanks! Nice read. No wonder that Daav agreed readily to have Theo get pilot training at Anlingdin, where his father had gotten his. Also thanks for more info on Lady yo’Lanna and her role and interaction with Korval and Guayar. I suppose that her lifemating to Justus happed soon after her coming of age and is just a normal lifemating, no wizard match. Hope we see Lady yo’Lanna on Surebleack soon. She will likely have multiple purposes for her visit – and I’d really like if she would find it in her to bring Maelin and Wal Ter for fostering – even if Nova will need then to enlarge her house. Her meeting Kareen and Kamele should be as interesting as her chat with the Delms. Regarding the additional connection to Anlingdin I wonder if Eylot is an exception or a symptom of something bigger – a more or less general and more or less secret military buildup and radicalization on how many and which worlds. And yes, will Korval act in pilot interest there? There is so much to get back to in the next books. How do you manage to juggle all of them? I am so glad you wrote this story. It fills in a little bit about what passed it the time before the main part of the story line.